I’ve been realizing lately that everything that Kemptville, Ontario poet Chris Turnbull produces could be considered part of a single, ever-expanding project, from the work included in o w n and her forthcoming trade collection, the visual and multi-voice continua (Chaudiere Books, 2015), to her explorations of how natural environments interact with printed materials through her collaborative and curatorial footpress installations. For a few years now, she’s been curating a poetry series in which solicited texts by poets (derek beaulieu, Pearl Pirie, Monty Reid, a. rawlings, Roland Prevost and others) are set in a variety of outdoor sites for the purpose of exploring what she calls “revision,” whether decomposition, weather spoil, potential spring flooding or any and all of the other potential naturally-occurring alterations that could occur. 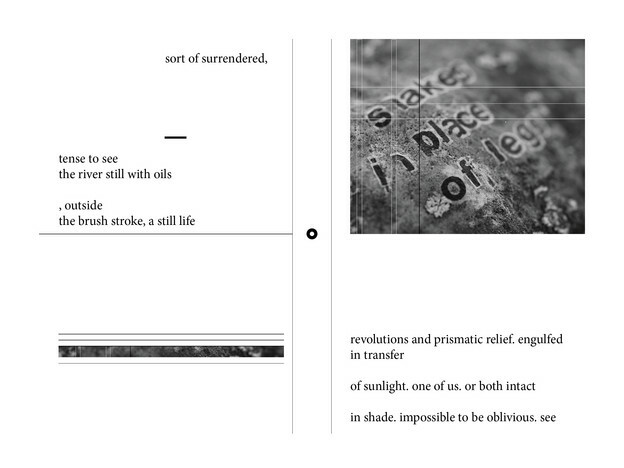 Each poem, in turn, becomes an ongoing text, set in collaboration with the environment in which it is placed (Vancouver poets Jordan Scott and Stephen Collis explored similar strategies for their collaborative Decomp). As she describes the project on the site: “rout/e started out as a trail underfoot, a bike path, a desire trail, a road, a creekbed, a contour line. The terrain shifts: rocky, swampy, soft, well marked, barely visible, wet, foggy, insect-heavy~[. ]” But unlike Decomp, the pieces Turnbull installs are meant to be discovered by anything or anyone along the trail, whether human or non-human observers, and deliberately allow the shifts of the season to potentially change how these pieces are seen, or even if they continue to remain visible. Each of her projects incorporate, to varying degrees, elements of text (including multiple voices), visual and concrete poetry and images (altered and unaltered) as well as elements of architecture, design, installation and visual art. Turnbull’s ease across genre and structural boundaries is remarkable, as well as the ease in which repeated readings both simplify and expand the complexity of a poetic that could only be described as incredibly precise. Making the marsh piece three dimensional – as a cube – is a way to move off the page – both in the writing and in the eye-ing/reading. I wanted to work with space, not only create a page by writing on surface. I’m interested in the spaces not defined by the words, the poem, the page, as such, but also the existence of space(s) without the words. While I do have to print the marsh sequence (on transparency), I’m using plexiglass and mirrors to maximize depth, transparency and reflection/refraction. Where I put the mirrors can create other geometrical shapes within the cube itself and also change the appearance of forms outside the cube. I’m curious about what gets eyed, what gets read, what gets avoided (and can’t be avoided). I’m very careful about certain elements of design in composing and constructing – making the cube requires measurement, cutting, precision, gluing, etc. with physical objects. I have to learn the materials and I make mistakes. I talk to fabricators, Chris at the hardware store, other folks who know about solvents and glues. The guy at the glass shop lends me solvent to try. Making the cube is also highly collaborative as I benefit from the expertise of others and learn the right types of questions to ask. It is essential to the making of the cube that this occurs. I don’t necessarily know how to make what I’m imagining – but I can move toward it by asking and trying. The scraps, scratches, pieces are still there, and so I start again, revisioning, reforming/shaping. I keep the mistakes. They’re physical. I’ve always felt that mistakes are important. It’s good to keep them, or put them aside and come back to them at another time. They’re opportunities and also elemental to design. I tend toward things tactile and kinetic and have been moving toward a ‘built’ poetry, and thinking about it, for quite some time. Looking back, I can see that certain directions I’ve been following, or approaches I’ve taken, have a pattern. For the past few years, I haven’t really had the sort of time, or energy, in a way, that I needed to commit to what is essentially sculptured or installation forms. It takes time to construct the cubes, for example, to think them through.